Today’s post comes from the pen of our special events coordinator, Mardel Robinson. Exciting things are happening this weekend! I love Fridays. But this Friday is even better than most; it signals the beginning of a special weekend for the AgriEnergy family. Today is owner Barbara Aley’s birthday and it’s the last full day that your usual blogger will go by the last name of Rumbold. That’s right. Tomorrow our very own communication strategist Katlyn Rumbold will marry the love of her life and become Mrs. Brian Sanden. In a barn, of course. Wearing cowgirl boots, of course. Surrounded by LOTS of supportive family members and friends, of course. Ever since that “bling” showed up on her left ring finger back in December, the AER “girls” (Linda, Heather, Annette, and me) have followed the wedding planning process and offered ideas and advice. I’m not sure how much our input was appreciated, but Katlyn gracefully accepted all of it. And now the big day is here! No more planning. No more advice. Just all of us at AgriEnergy Resources wishing Brian and Katlyn a lifetime of love as husband and wife!! P.S. There’s one more good thing about this weekend. It’s Labor Day Weekend! That means the AgriEnergy office and plant will be closed on Monday, September 7, so our employees can spend a little extra time with their families. I can not wait for you to meet today’s Farm Favorite Friday author! She grew up in Bureau County and is currently working at the local vet clinic while working on her college degree. I got to know her through 4-H and let me tell you she makes the BEST CUPCAKES. They look like Angus heifers! Anyway, her talents are many, but her way with words will stop you right in your tracks. “Life is full of surprises. It often takes us on turns we never expect, throwing us into situations we never imagined would we’d be in. As life gets hectic, often the refuge we seek is rooted where we grew up or in a place like it. I think this is especially so for those who started out in the country. Though life may call us away, there seems to be an irreplaceable, almost ethereal feeling to heading back and appreciating the slow, quiet earthen atmosphere. Just for a minute, sit back and take a journey with me. An early morning walk brings a sneak peek of a wondrous scheme unraveling beneath my feet. Pops of bright green spring up from the ground, not quite ready to reveal their surprises; trees quiver, shaking off the stiffness of a long winter rest; animals stir, preparing for the coming of new young; the sun smiles down on us all, welcoming the new spring. Before long, though, the peaceful awakening is replaced with the buzz of life. Temps warm and send people and animals all around me flocking to the sunlight, soaking up its freedom and overwhelming the land, afraid to lose any time. Tractors and lawnmowers bring a comforting hum, moseying across the soft earth. Horses plod down trails, kids shinny up tree branches, and gardeners amble in the dirt, delighting in the feel of earth between their fingers. Summer has arrived. But there is no time to waste because soon a crisp breeze cuts through the air and the earth begins transforming again. Deep maroons, fiery reds, golden yellows, and burnt oranges paint the landscapes. Leaves flutter around me, stealing my attention, and showcase the Lord’s brilliant design. Farmers and hunters take the scene, stripping the land of its bounty and providing for the world’s needs. As we gather together to thank our creator for His blessings, glittering flakes begin to fill the air, bringing with them the cold bite of winter. Carols and Christmas tunes permeate the homes, and children scramble to pull on their mittens and scarves so they can go whizzing down the hills on bright colored sleds past gleaming icicles that bedazzle the trees for miles and miles. No, there isn’t anything quite like being out in God’s country. Whether it’s going to the barn to visit the livestock, gazing across the land that stretches for miles, or enjoying a meal grown from food you tended to yourself, there is nothing that can replace that feeling, no words to even describe it. No matter the time of year or the season, there is always something new and wondrous, always something to amaze us and bring us peace at the brilliance of our Father’s hand. I still have a lot of things I want to do in my life, places that I want to go: big cities, national parks and monuments, beaches….who knows, maybe I will even end up living in a bigger area, surrounded by homes and buildings. I don’t know what God has planned for me, but I do know that when the stress and strain of life start weighing me down there is only one place I will return to for true peace: The loll of gently swaying trees spanning all around me, animals sauntering quietly along their way, flowers poking up wherever they choose to bloom…All taking me away from rushing, hurried people, cold, hard structures, and petty, unnecessary drama. And if you have a similar story you’d like to share, we’d love to feature you right here next week. Please email your story to krumbold@agrienergy.net. Keep calm and nature on! I am so excited to introduce you all to John Mayernak and his guard dog Maggie for this week’s edition of Farm Favorite Friday (FFF). 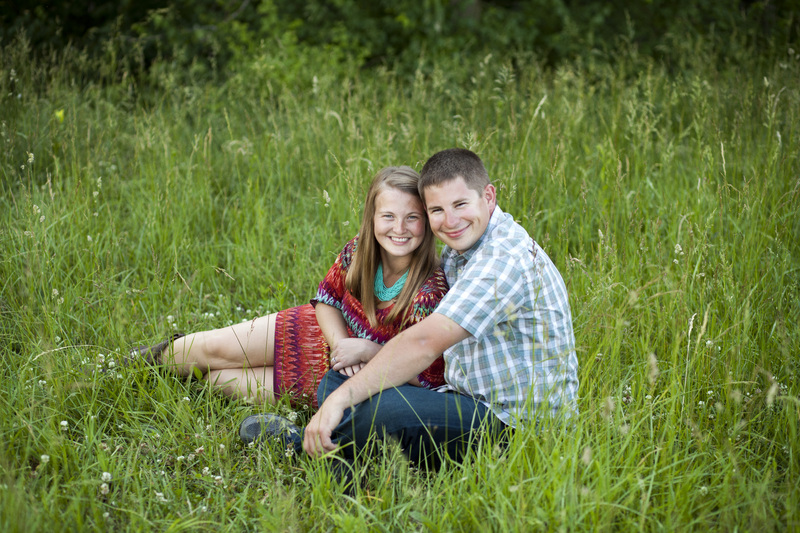 John hails from a farm town in Iowa, but now resides in a rural community in Illinois. He thrives on feeding the soil what it needs to remain biologically alive. His favorite aspect is watching how Mother Nature can come full circle. “I planted a perennial crop on a part of my worst acreage of my farm in Iowa. It was abused and misused and the renter couldn’t even grow a decent corn crop on this ground. So I tried a perennial crop hoping that nature would recover on this ground and turn it into something fertile and alive. I helped a bit with dry humates and soft rock phosphate, but the first three years I fought weeds, always dry, big cracks on the surface, a place you can’t even grow a decent corn crop! Two years ago in early spring the clover appeared. I didn’t seed it, none of my neighbors seeded it, it just appeared, nature’s first beneficial invader. As time passed, the clover took over more of the hurt ground and within two years the whole “orchard” was covered in white clover, holding water by breaking up the top soil with roots, keeping the weeds away, and generally turning the patch into a perfect example of giving nature an opportunity, she will rearrange things to be beneficial and alive. Amazing what happens when we give nature an opportunity to do what it does best – continue the circle of life. So who wants to share their favorite part of country living next week? Remember, it can be about anything that makes the farm/ranch life unique to you. Because we can only talk so much about soil health, biological farming, and organic farming… welcome to the first installment of Farm Favorite Friday. Farm Favorite Friday is about you! We want to share our favorite aspects of farm life and we want to hear your’s too. Each Friday, we will feature somebody new. You can share a video, pictures, memories, recipes, lessons learned — anything that makes the farm life unique to you. So to get things started I’m going to kick off this series with my top secret apple cinnamon muffin recipe. Seriously, this is the ONE treat my farmer BEGS for each harvest season in the combine. Farm wives/girlfriends/daughters listen up. Men, take notes if you want to impress. First off I firmly believe the quality of an apple cinnamon muffin starts with a really knowledgable farmer who has learned how to grow a really good apple. I use apples from Christ Orchard located near Elmwood, Illinois. In my personal opinion, the Christ family have mastered the art of a really good apple. They seem to have that down to an exact science using various types of fertilizers. So without further adieu, here is the recipe I haven’t shared with anyone until now. You’re welcome. They even seemed to be a hit in the office. Sift together flour, baking powder, salt, and cinnamon in medium bowl. Set aside. Cream together butter and sugar until lightened in color, about 3 minutes. Add the eggs. Mix in vanilla. Gently stir in flour mixture, alternating with milk. Stir until combined. Stir in diced apples and scoop mixture into muffin tins. Fill about 2/3 or 3/4 the way full. And this my friends is one of my farm favorites. So who wants to share next week?